These days, it seems like everyone's twittering. Now, even attorneys are getting into the Web 2.0 act. Corny, but true: adversity brings opportunity. In these economic times, business owners have a greater motivation to assess return on investment, personnel performance, capital improvements, market share, lease eaters and cash positions. Fear clarifies. With clarity, small law firms cannot help but thrive if they are willing to embrace the risk on practical terms. What does this mean? WASHINGTON -- A week before her Senate hearings, Republicans are floundering in their efforts to trip up Supreme Court nominee Sonia Sotomayor, unable to find an effective message about why she's not fit to serve. NEW YORK -- A bankruptcy judge has ruled that General Motors Corp. can sell the bulk of its assets to a new company, potentially clearing the way for the automaker to quickly emerge from bankruptcy protection. As a law school devoted to the big picture, California Western hosts a number of institutes, centers and programs that enrich students' law school experience while enabling California Western to have a substantive impact on the broader society. Professors and students involved in the programs shape real-life legal events -- whether freeing wrongfully convicted inmates in California or offering pro bono legal advice to the indigent and underserved in San Diego. Like companies in all industries, law firms are developing new strategies to face today's challenges. Law firms that have a diverse client base, a commitment to service and a solid foundation rich in tradition will likely better weather the uncertainty of the times. Litigators are not invulnerable to the do-more-with-less charge from their clients. Staying on this path is easier thanks to efficiencies gained through digital applications in litigation. In construction defect litigation, Silldorf & Levine LLP has been recognized as one of California's leading law firms. For more than 20 years, Silldorf & Levine has been involved in the prosecution of construction defect claims on behalf of homeowners associations and homeowners throughout Southern California. The firm has recovered more than $150 million for homeowners and homeowners associations. With the steady stream of big firm layoffs, businesses are aware of the instability of some national law firms. In March, a New York firm laid off 200 lawyers and watched as partners fled to competitors. A month earlier, a Los Angeles firm became the first top-10 firm to conduct major layoffs when it let go of 440 employees, comprising over a fifth of its total work force. According to Lawshucks.com, at least 10,000 employees at national firms across the country have lost their jobs this year alone. With national firms shrinking, who is filling the gap and serving existing businesses? The failure of a business owner, who is a party to a legal proceeding for the dissolution of his/her marriage, to disclose business assets and activity can lead to severe sanctions. The California Family Code requires each party to fully disclose to one another all assets, income and debt, whether it be separate or community property. Recent court interpretation of these provisions resulted in draconian sanctions to business owners who failed to provide information that identified business assets and business activity, or who failed to provide information that would allow his/her spouse to "value" the business interest. Longtime Casey Gerry partner Frederick Schenk has been elected to serve on the board of governors of the world's largest trial bar: the American Association for Justice (AAJ), a Washington, D.C.-based organization with more than 55,000 members worldwide. Billable hours. The lifeblood of a litigation law firm. The thorn in the side of young associates and clients alike. Ensconced in the tradition of law firms, generations of trial lawyers have used billable hours as the foundation of their revenue. While most lawyers at some point in their career question the irony of "the more you work on a matter, the more you make," very few have found a way to change this modus operandi. In today's world, Internet communications have come a long way, even replacing the traditional letter, Christmas card and many other forms of paper communication. The ever-popular e-mail message has even been improved with the advent of chatting and instant messages. Instantaneous dialogues allow people to stay connected constantly, whether they are a block or an ocean away. 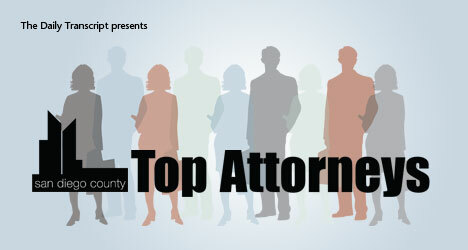 Top Attorneys 2009 pays tribute to San Diego County's legal cream of the crop. It is the culmination of a lengthy peer voting process that began in March with the announcement of a call for nominations. San Diego County lawyers were asked who among their peers -- with whom they had professional experience -- were worthy of recognition. San Diego Mayor Jerry Sanders reiterated his stance against the state government borrowing funds from local municipalities Thursday, saying the city plans to sue over at least one of Sacramento’s tactics. Luce Forward Hamilton & Scripps has established a new business succession planning team to help family-owned and closely held business owners transfer their businesses to the next generation or profitably dispose of them. Sheppard, Mullin, Richter & Hampton LLP recently launched a legal blog for the video game industry -- lawofthelevel.com. The online resource will focus on issues important to the gaming sector.